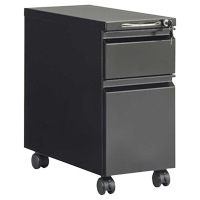 The Steel Mini Pedestal from Safco Products can store papers, files, and other office supplies in a convenient and safe way. The lower file drawer can be configured for storage of letter or legal-size folders while the upper drawer can be used to store smaller stationery and office supplies. 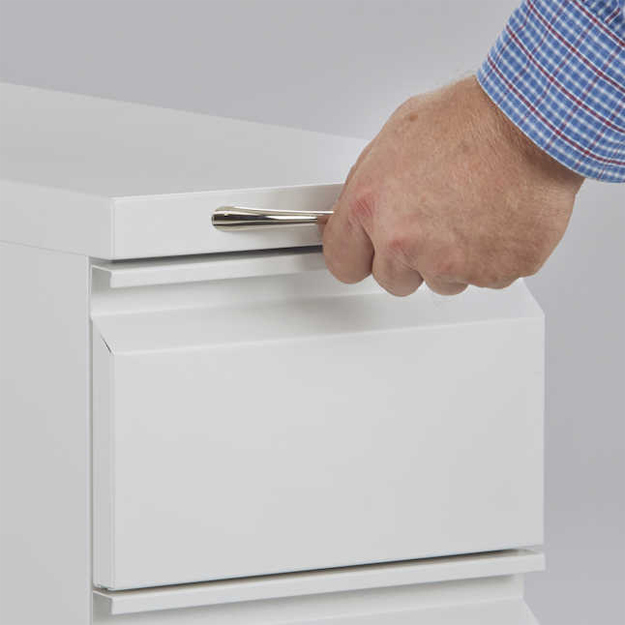 Both drawers are lockable with a single key, thus providing a secure location for personal or sensitive documents. 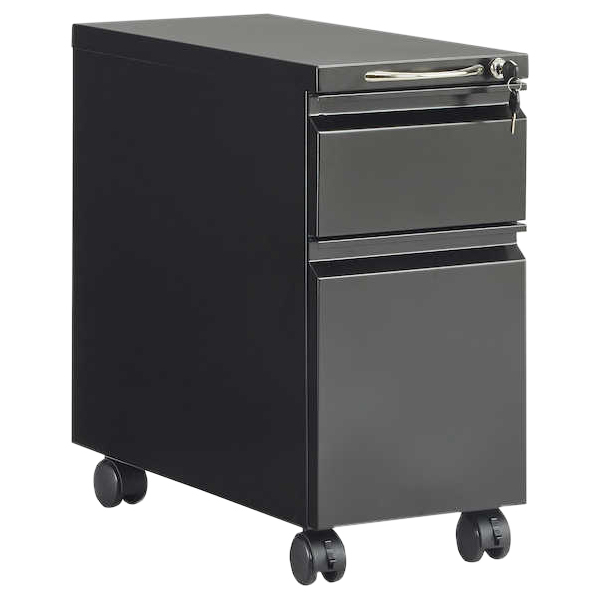 This pedestal is mobile on 4 casters (2 locking and 2 non-locking) and constructed of sturdy steel. This product is ideal for use with height adjustable desks, as its maximum height is about only 21" (clearing most sit-stand desks at their lowest height). The Steel Mini Pedestal is available in two models. The standard model which is just the pedestal and a model that includes a 10.5" W x 22" D x 1.5" thick padded seat that fits on top of the pedestal to create a storable temporary seat ideal for small workplaces. Offers Accessible Document Storage - One of the drawbacks when transitioning to a sit-stand workstation is the sacrifice of file storage. The traditional file and drawer pedestals that fit below a "standard height" desk cannot be used when the entire desk is lowered to an appropriate working height, heights that can be as low as 23". In today's more compact workspaces this leaves workers struggling to find space for necessary papers, office supplies and files. The Steel Mini Pedestal is low enough to fit below most sit-stand desks at their lowest settings and narrow enough to be stored without overly encroaching on leg space. The lower file drawer can be configured for hanging of either Letter or Legal-sized file folders while the upper drawer can serve as storage for general office and stationery supplies. Compact Temporary Secondary Seat - Tight constraints in new office layouts mean that there is no extra space for a second chair. The SEAT model of the Steel Mini Pedestal addresses this by offering a 1.5" thick padded seat that mounts on top of the pedestal. The pedestal can now be easily pulled out to become a compact temporary seat for short meetings. When no longer needed the pedestal/seat is stored back below the desk. 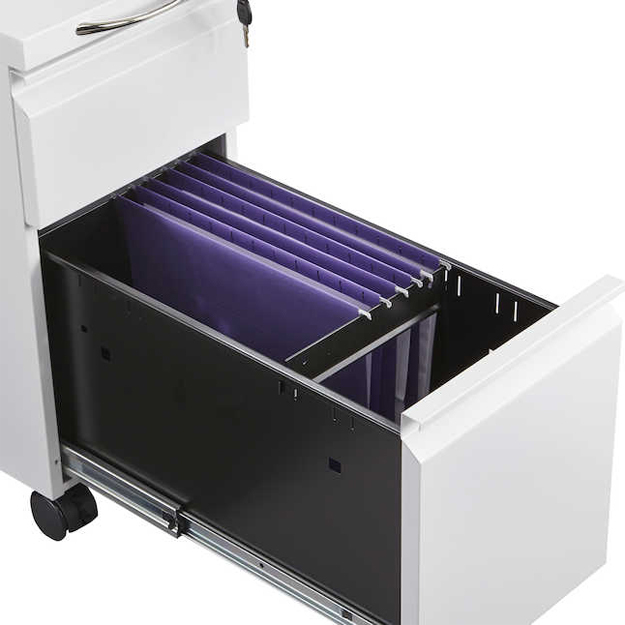 Configurable Hanging File Storage: The lower drawer can be configured for utilizing either Letter or Legal-sized hanging folders. Upper Storage Drawer: The upper drawer will accommodate personal and office supplies. 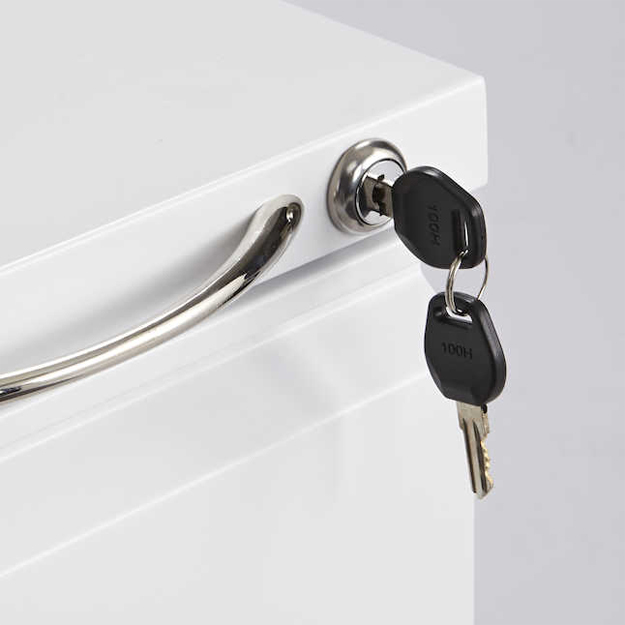 Lockable: A single keyed lock secures both drawers to ensure privacy and document security. Ball-Bearing Movement: Quality steel ball-bearing glides offer full support and smooth movement of both drawers. 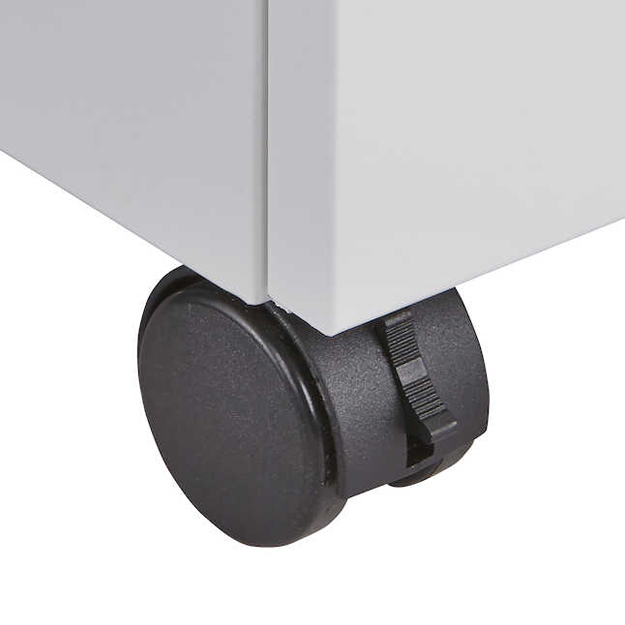 Front-Mounted Handle: A convenient handle facilitates easy movement of the Steel Mini Pedestal. Locking Casters: Two of the casters are lockable. When mounted to the front it is easy to lock the pedestal in place so it does not move when drawers are being opened and closed. Unlocking those casters allows lets the pedestal be easily moved where needed, such as on the seat model. Employ the Steel Mini Pedestal to keep documents organized and minimize desk clutter. Even in offices where most work is computer-based there is almost always a need for some storage. This unit will keep those important files at hand and all the miscellaneous office and personal items neatly stored. FITTING SUGGESTIONS: When determining whether this will fit below your desk, first position your desk at the lowest work setting that you will employ. Then measure from the floor to the underside of the frame crossmember. This is the necessary clearance height that you will require. If your crossmember is far enough back or if you are willing to have the pedestal project beyond the front of the desk you may wish to consider placing it in front of the crossmember. In that case you can measure from the floor to the underside of the desk surface. Please remember that any protrusions below the desk underside need to be accounted for (e.g. ensure that your control panel will not make contact with the pedestal surface when the desk is lowered).